This site provides downloads for POPELSCAN (originally from http://www.mylaserpage.de). All popelscan shows (popelshows) and .mot-files are free of charge! 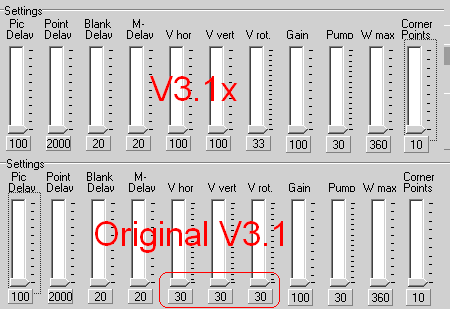 NOTICE: v3.1 shows are not compatible with Popelscan V4.x shows and vice versa! solchen Gelegenheiten erst Recht Löcher in die Netzhaut. Und schützt auch das Publikum: Nicht mit dem Laserstrahl auf Personen strahlen. your retina within a few milliseconds. Save yourself, save your eyes, and save the audience: do not let the beam hit people! (20. August 2008): Sorry for the delay :-) Probably you got here from http://www.popelscan.de, the rebuild Version 4.0 from Robin. Looking for the passwords? Well, just send me an Email using this link: email me! I'd be glad if you use "Laser" or "Popelscan" in your topick, otherwise you need to be lucky that I fish your email out of the trash. The passwords are still free of charge, as are the shows. Please be reminded that there are now two versions of Popelscan available, the original Popelscan Version 3.x and Version 4.x on popelscan.de. The latter new version does not work properly with the show files downloadable on this website, but needs the recompiled shows from popelscan.de. However, the passwords work for either zip archives. (16. October 2006): Got some feedback - thanks, guys :-) I really hope you enjoyed the shows. (6. July 2006) Long time no read! I was quite busy the past vew month, but alas, not with new shows. However, one of my show recipients recorded a show on video and dumped it onto youtube.com. Even though "only" RGY instead of RGB, it gives one a good impression. Fun to watch, even for me :-) Thanks, FreakStrike! (18. December 2005) Just before Christmas I was urged to finnish a very small "quick'n'dirty" Laser show. I barely had two evenings to get it up and running, so it might be a little rough - don't expect too much ;-) Anyway: go, get it! And have a peace- and cheerful Holiday Season! (18. October 2005) Well, try this! ;-) It's not absolutely finnished, I bet there will be a more blue version 2 of The Blue Planet (alas for those without blue). But anyway, that may take a while and I thought: in the meantime you might be interested in the v1.0 results. And who the says you cannot blend in and out with TTL? Enjoy! (12. October 2005) Whoopsie: Sorry for the announcment and nothing to download... the links for the Battle files just managed to vanish somehow, but now it's back again. Sorry again! (09. October 2005) Announcement: Something new is coming up :-) I've spent some spare time and.., well: smooth, small (alas: again :-) and superb (IMHO), kinda boombastic. If you know BBC's The Blue Planet series, you're probably knowing where this leads to... I just need my wife's approval to smoke in our living room again for fine tuning the show, and then it's yours! Send an email to get the free passwords! Hey, check out iTunes to get a feeling of the sound track(s)... Btw, some small changes are found in the older shows as well - download them and replace the old ones on your hard disk with the new zips and mot files (please, spread only the NEW files, if necessary). Again, all shows are still free of charge! (04. October 2005) Small fix for Battle Without Honor Or Humanity: The "Explosion"-mot had a switch 2 set, now cleared. (02. October 2005) Now playing in a Laser theater near you - or simply in your living room: Battle Without Honor Or Humanity! I've tried hard, but couldn't succeed in crapping up the this famous sound track... ;-) I'm pretty happy with the outcome, even though one or two stretches could have been made better, sure... Well, go ahead and fix it! And please send back feedback! Oh, and one more c thing: All seven Popelscan colors supported! This is blue (yeah! ), red, green, aqua (cyan), purple (magenta), yellow and white. (sometime before) The new show files contain MOT files with interpolated blanking between the first and last points of a frame. Also, distances between blanking points are optimized, so all MOTs shall work well with even faster galvos like the GS120 or better. If not, please drop me a note and I will try to optimize the particular MOT file. RGB+CYMW (full seven colors!) 3:08 - read the readme for more details! Please send an email to ask for the password. RGB+CYMW (full seven colors!) 2:49 - read the readme for more details! RGB+CYMW (full seven colors!) 2:28 - read the readme for more details! RGB/RGY-Show 2:35 - read the readme for more details! RGB/RGY-Show 1:56 - read the readme for more details! RGB/RGY-Show 4:21 - read the readme for more details! Please send an emailto ask for the password. RGB/RGY-Show 2:44 - read the readme for more details! RGB/RGY-Show 2:26 - read the readme for more details! Popelscan v2.9 O Fortuna - Carmina Burana - Carl Orff. "Orff - Carmina Burana O Fortuna.mp3" necessary. Faster Scanners watch out: Not optimized, might contain huge spans! This is no dead end. 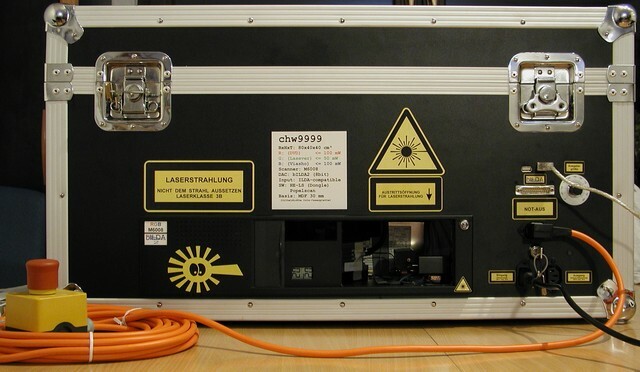 Check out the following sites, if you need more information about lasers!